This is a weird one, I'll admit it. But I can't be the only one who loves all the different, appropriately themed garbage cans around Disneyland! 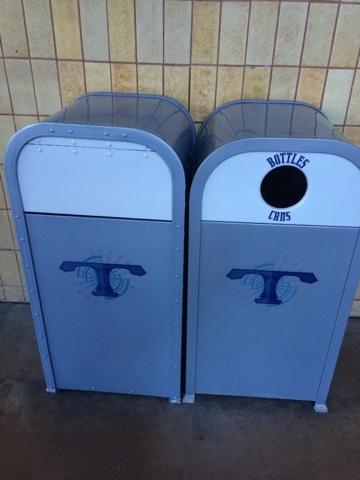 There are cans for each land, and some rides and restaurants have their own designs. They're so popular that they even sell small porcelain cans as salt and pepper shakers! 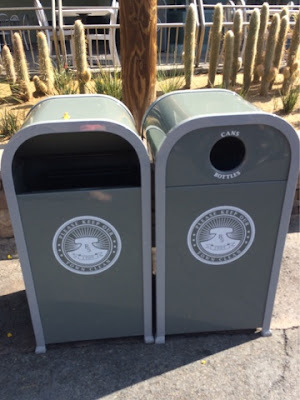 My husband and older son were in line for the Matterhorn and they saw a garbage can on fire! It was near the smoking section, so I'm guessing someone threw away a cigarette that wasn't out. 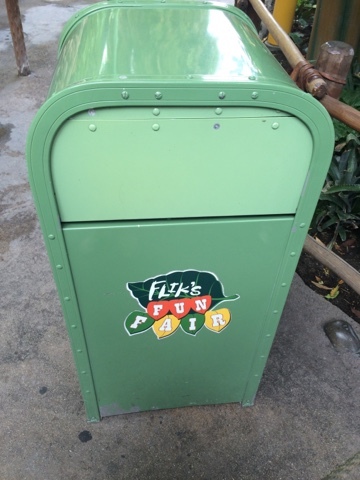 Cast Members came to put it out and take the old can away. I was sitting a little ways up giving my younger son a snack and saw a CM pushing a garbage can on a dolly. I didn't look damaged at all, which was weird considering it was on fire. I didn't even know there had been a fire until my hubby told me later. 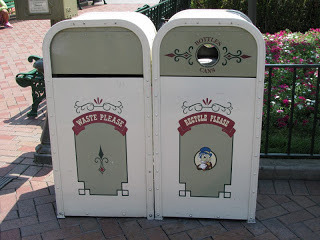 Anyway, he was talking to some guests and as he walked by I heard him say, "Guess how much it costs to replace one of these!" He took a few guesses before revealing the answer..... $800! At least they're cute and durable for that kind of money, right? So let's take a trip around the Disneyland Resort, led by the garbage cans! 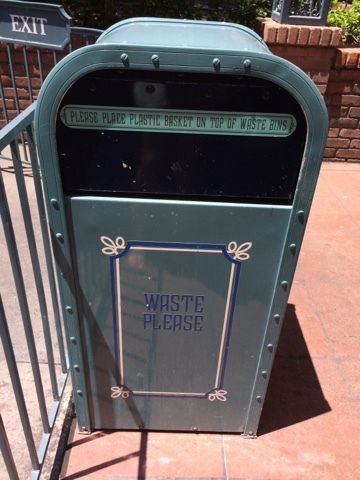 My favorite thing about the Disneyland garbage cans is "Waste Please." It sounds like a request for wasting, and I've always thought it's hilarious. I really think these are my favorite. 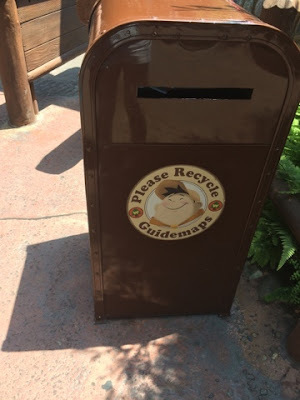 Such a cute design that fits in well with the land! 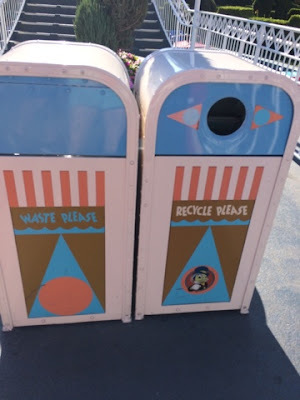 This can has special instructions for throwing away food, in perfectly themed font and color of course. Metal garbage cans made to look like wood. 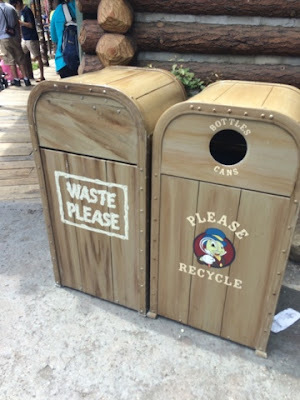 Only at A Disney park, am I right? Does it bug anyone else that there isn't paper recycling? Disney doesn't even sell cans! 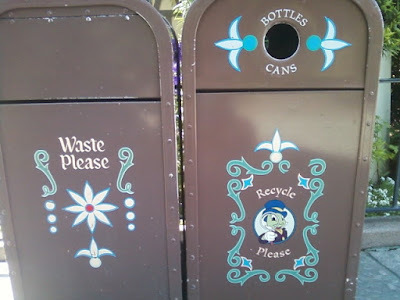 Small World gets its own design in perfect, Mary Blair inspired style. A goofy design for the land Goofy lives in! These are probably my least favorite. They're fine, just kind of plain. 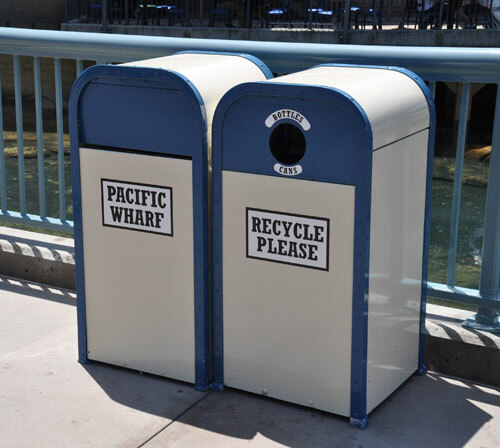 Say, "Hello" to California Adventure and, "Goodbye" to the Waste Please design. Bummer! 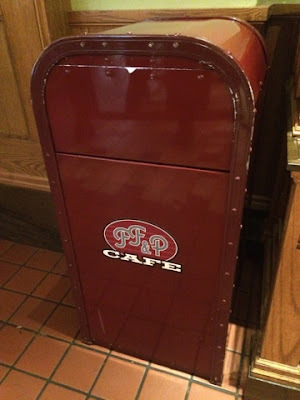 Disney Starbucks is the best place to go when you're waiting to get into the crazy line for a Radiator Springs Racers fastpass. 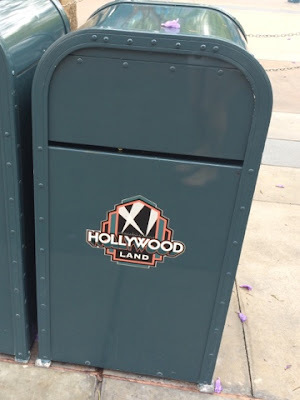 It seems like DCA just put the logo for each land on their garbage cans. 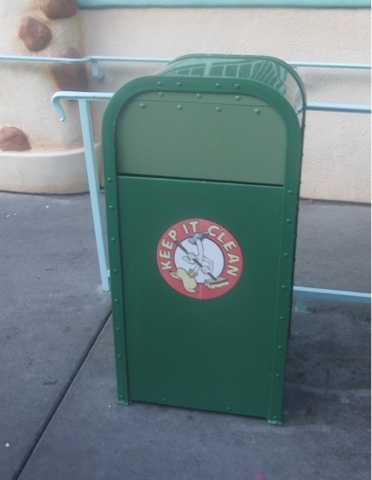 It's just trash, I know, but it's a noticeable lack of effort that, I'm sure, someone spent a lot of time on in DL. 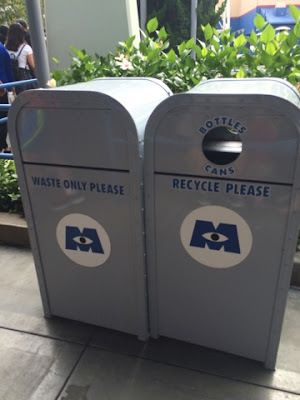 There are tons of garbage cans in line for this ride! It seems way more than other rides. At least they get their own cute logo! I'm not into the rides in Bug's Land, but it's so cute! 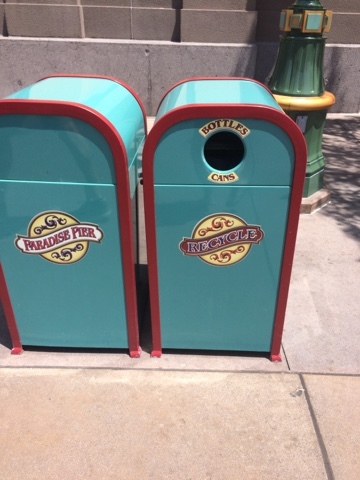 I'd be happy to keep your town clean, Radiator Springs! Wow, these are so plain...I have nothing else to say. Just another land logo, but very colorful! 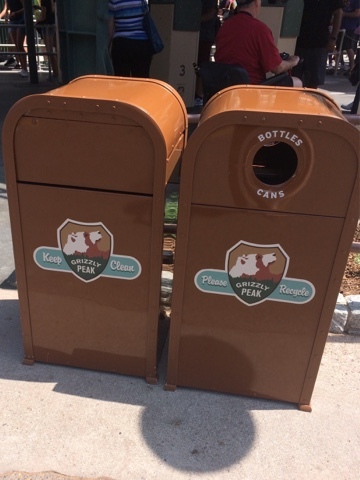 I really like the way they've redone the Grizzly Peak area! Bonus! 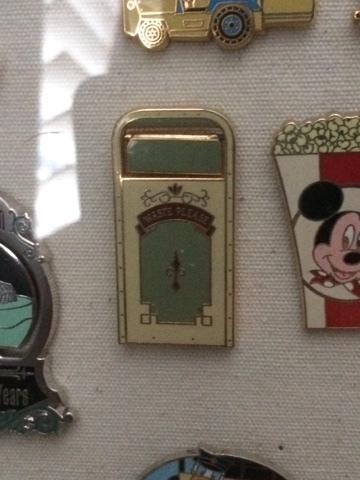 My Disneyland garbage can pin!! 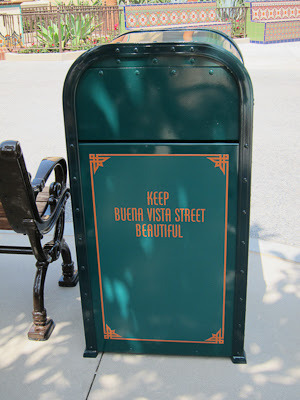 How can you write an article about the garbage cans of Disneyland without mentioning PUSH the talking garbage can? 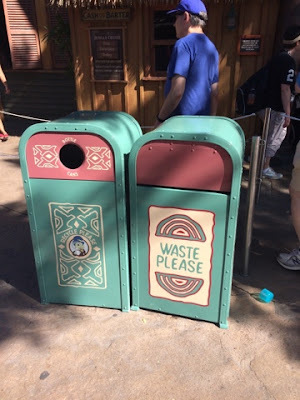 I've always giggled about the "Waste Please" request as well!